This year we are implementing some changes to how we handle entry to the Salon! Beginning at 6pm Sunday, ticket holders can stop by the second floor Registration Desk to get a number which will correspond to a place in line for themselves or their group. At 7:30pm we will start to show folks into the Salon in number order. The lowest numbers will be reserved for people who need the help of assistive devices or staff to get seated. There will be chairs available near the door as in past years for people who need to sit until their number is called. If you miss your number, simply let the door person know, and they will include you in the next group. We will also be able to give approximate estimates of when a number is likely to be called when you pick your number up, allowing you time to relax, eat dinner, and socialize anywhere in the hotel. What’s a little decadent, a little laid back, and full of great conversation? Our Dessert Salon! 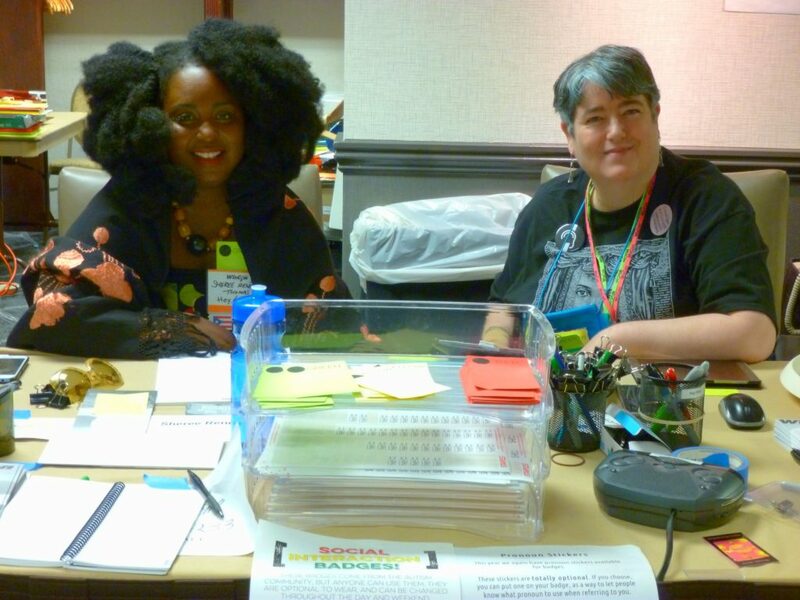 Every year, right before the Guest of Honor speeches, WisCon members (who have purchased a salon ticket) enjoy delights crafted by the Concourse’s pastry chef, up to two desserts per ticket-holder. We do work with the pastry chef each year to make sure we provide an array of desserts that suit various dietary needs. The menu is here. At the salon, if you have specific dietary issues please let a volunteer at the door know to set aside items to make sure you get a piece (or two). The salon is in the Concourse’s ballroom, where round tables seat 10 people each. Early arrivals sometimes tip chairs forward to save a seat for fellow members. Navigating this cozy environment can be a challenge for members with large space bubbles — let a volunteer know if you need to be seated early. The Dessert Salon can also be quite noisy, which you may want to take into consideration before purchasing a ticket. Ticket-holders are admitted at 7:30pm. At 8:30pm, the doors open to all members, free of charge, for the Guest of Honor speeches and any award ceremonies that WisCon is hosting. Many WisCon members enjoy dressing in their finery for the Dessert Salon. Just as many prefer to attend in jeans and a t-shirt. There is no one right way to dress for the event — you should attend dressed in the way you think is best.